Back to basics with Neon’s Instant Bellydancer – A t i s h e h. Dance. Fitness. Joy. Every now and then you just have to go back to the basics. What’s the context? Well, there’s a bunch of context. I recently signed up for the launch of Nadira Jamal’s online program, Rock the Routine. It’s what she calls a “home study” course, and I’m doing it at my own sweet pace — which is to say, at the pace permitted by an international move and a baby. Although I’m unlikely to perform a full cabaret bellydance routine anytime soon, I’m finding it great. Part of what’s so valuable about it is that following along with the program makes me see what I need to work on. While Nadira teaches improvisational strategies, as I try to work with them I start to notice which moves come really easily, and which bellydance moves have become, well, flaccid due to lack of practice. I’ve become frustrated enough with this that I decided I needed to go back to the basics. Not just basic choreo or easy drills, but the fundamentals. I didn’t want something with long explanations, but I wanted the chance to focus on the movements, to work on everything from the ground up. So I thought of Neon’s Instant Bellydancer. Now, the two Instant Bellydancer DVDs were among the first items in my bellydance video collection. (I bought the individual videos, Instant Bellydancer 1 and Instant Bellydancer 2 back then, and years later was sent a copy of the two-DVD set for review). Although it’s really more of a movement catalogue, not a thorough program of dance instruction, I loved it. And I loved the little geometric shapes used on the screen to indicate how movements should be performed. 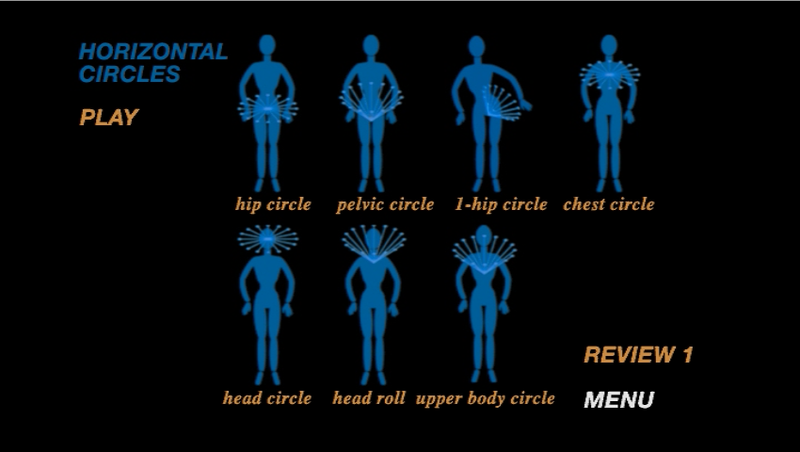 Each shape is performed with various parts of the body: the hips, the chest, the head, and then the movements are put together into basic drills. What is it like to work with Instant Bellydancer years later? On the minus side, the lack of a warmup really stood out for me. Given that it’s for beginners, it should have a warmup, especially since the moves start to really push your muscles if done correctly. There is also a section with head and upper body circles that is potentially dangerous. Neon gives multiple, and I mean multiple, warnings to avoid these sections unless you are warmed up and have strong neck muscles, but I suspect that some people might go ahead and do them anyway. I only made it through the horizontal circle section last night, but it was quite a bit to work with. More interestingly, I thought it would go wonderfully with Nadira’s tips on making friends with your safety moves, that is, with the moves you tend to resort to when out of ideas anyway. Some of Nadira’s instruction, on her blog and on Improvisation Toolkit Volume 1: Movement Recall, involves taking a basic move and doing variations of it. And in a way, this is precisely how the mini practice sessions on Instant Bellydancer work! One program is very basic, while the other is quite advanced and sophisticated, but their methodical approaches to dance make them work well together.